My daughter took macaroni and cheese with kale for lunch in her Kapsule Vacuum Jar. She found it very easy to use and wants to take soup in it next. The Kapsule Vacuum Jar did make her lunch bag heavier, but that is a minimal trade off for food safety. Why pack your child a healthy, organic lunch, just to have the meal tainted by plastic. ReusableBags.com offers great alternatives to plastic food containers. 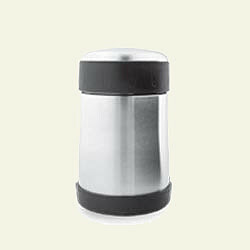 Just type in “stainless steel vacuum jar” in the search box at ReusableBags.com to find this great product.